On October 6th, 2018, a Senate vote of 50 to 48 officially confirmed Brett Kavanaugh as justice of the United States Supreme Court. Not only was this highly divisive decision among the closest votes for a Supreme Court nominee in American history, Kavanaugh himself – accused of numerous incidents of sexual assault, withholding documents from his time serving in the George W. Bush administration and lying under oath – goes down as the most unpopular Supreme Court justice appointment in modern history. A Quinnipiac University national poll found that nearly 50 percent of American voters, including 55 percent of women, opposed the judge's confirmation. Naturally, this unprecedented unpopularity got many Americans thinking: "What about the removal of a Supreme Court justice?" The short answer is that removal is possible by way of impeachment, but strap in for some history lessons and you'll find out why it's not an easy task. A justice of the Supreme Court of the United States may be removed via the process of impeachment, but the scenario is historically unlikely. Decisions made by sitting Supreme Court justices are often felt throughout the country for decades, and sometimes even beyond. Not only does this add an incredible amount of gravity to the position, it makes the potential removal process quite the weighty proposition. To get to the meat of it, though, Vox senior correspondent Dylan Matthews put it pretty plainly: "It works just like impeaching a president." "The judicial Power of the United States, shall be vested in one supreme Court, and in such inferior Courts as the Congress may from time to time ordain and establish. The Judges, both of the supreme and inferior Courts, shall hold their Offices during good Behavior, and shall, at stated Times, receive for their Services a Compensation which shall not be diminished during their Continuance in Office." It's important to remember that impeachment is simply the process by which a governmental body levels charges against a government official. Like an indictment in the world of criminal law, an impeachment is only a statement of charges – impeachment itself does not mean removal from office, nor does it mean conviction for a crime. In fact, it's just the beginning of the process. Though the Constitution grants us the ability to impeach, it has some rather problematic wording: Chiefly, the phrase "high Crimes and Misdemeanors" is more than a little vague. As ongoing debates indicate, it has no clear legal definition in this context. A 2010 report for the Congressional Research Service by Elizabeth Bazan notes that "the precedents in this country reflect the fact that conduct which may not constitute a crime, but which may still be serious misbehavior bringing disrepute upon the public office involved, may provide a sufficient ground for impeachment." But she goes on to say, crucially, that "What constitutes an impeachable offense is less than completely clear." In increasingly partisan modern legislatures, this often makes impeachment very much a matter of political will as much as it is one of legal analysis. More than that, there's really not much historical precedent for impeaching a justice based on the Court's rulings. Chief Justice William Rehnquist wrote in his 1992 book, "Grand Inquests," that "judicial acts – [a justice's] rulings from the bench – would not be a basis for removal from office by impeachment and conviction." In light of the divided discourse over the meaning of "high Crimes and Misdemeanors" and other murky legalities, it helps to take a look at past calls for legal inquiries to better understand the possibility of impeaching justices serving on the Supreme Court. Keep in mind that these are cases where the potential for impeaching the justice simply entered the public discourse or inquiries into impeachment were held; they are not actual impeachment cases. Because there has only ever been one impeachment of a Supreme Court justice, these precedents are often the closest we get to what impeaching a Supreme Court justice actually looks like, especially in the past 200 years. Sometimes, calls for impeachment come from the people. In the 1950s, billboards emblazoned with "Impeach Earl Warren" appeared across the Southern U.S. after the justice's Supreme Court decision during historic desegregation rulings. Again in 2015, a Change.org petition called for Supreme Court Justice Antonin Scalia to step down after he made racist comments regarding the admissions plan at the University of Texas. Most recently, in Justice Kavanaugh's case, four women – Christine Blasey Ford, Deborah Ramirez, Julie Swetnick and one anonymous alleged victim – accused the judge of sexual assault, igniting a firestorm of controversy among an already disruptive nominee presented during a period of extreme partisanship. Additionally, former Deputy Assistant Attorney General Lisa Graves called for Kavanaugh's impeachment for lying about stolen memos that the second Bush administration used in previous judicial confirmation hearings under oath. Months prior to that, former New York Times Executive Editor, Jill Abramson, called for an impeachment inquiry against Justice Clarence Thomas for allegedly lying about sexual abuses toward attorney and educator, Anita Hill. While this gives us some insight on why people historically call for the removal of a Supreme Court justice, calls for impeachment – even from on high – are nothing more than formal requests or public, on-the-record suggestions. Acting on impeachment falls to the House of Representatives. While calls for impeachment kick-start the process, hard-and-fast Supreme Court justice impeachment rules don't officially come into play until the House of Representatives steps in. First, the majority of the House needs to approve an indictment, which is basically, a formal accusation to impeach. Because no controlling authority defines "high Crimes and Misdemeanors" (other than Constitutionally agreed-upon crimes like treason and bribery), members of the House ultimately decide their own standards for impeachment. Moving past that debate, once articles of impeachment are passed, the U.S. Senate holds a trial to determine whether or not removal of the justice is reasoned and appropriate. This trial is very much akin to a criminal proceeding held at the state or federal level, but because there are not many impeachment rules committed to our country's governing documents in ink, the Senate may decide to pass a resolution that determines the specific trial procedures before the impeachment trial begins. The trial itself, again like a criminal trial, will include witness testimony and the presentation of evidence from both supporting and opposing sides. In order for the removal of the Supreme Court justice to occur, at least two-thirds of the Senate must vote to convict the justice. That two-thirds is a portion so large that it's known as a supermajority. Boiling it down to hard numbers, it means that the Senate needs 67 votes to pass a conviction. In the history of the United States Supreme Court, only one sitting justice has ever been impeached. That judge was Samuel Chase, an associate justice of the Supreme Court. Chase was a Federalist appointed to the Supreme Court by George Washington. In 1804, the House of Representatives passed articles of impeachment against Chase after then-President Thomas Jefferson called for an impeachment inquiry. His reason? Chase had openly criticized the president and his policies in front of a grand jury in the state of Baltimore, leading Jefferson to claim that the justice's partisanship undermined his judiciary objectivity. While Justice Chase was indeed impeached, he was not ultimately removed. Rather, he was acquitted by the Senate in 1805. Importantly, this unsuccessful impeachment set some bounds for the use of impeachment powers moving forward; namely, it warns against using judicial decisions as a basis for impeachment. The Supreme Court justice term is a lifelong position. That's where Article III, Section 1 of the Constitution really comes into play – that's the part that says justices of the United States Supreme Court "shall hold their Offices during good Behaviour." Voluntary resignation, as was the case with Supreme Court Justice Abe Fortas, who resigned before he could be impeached for accepting $20,000 in Wall Street bribes. These account for all the available methods of vacating a position from the Supreme Court bench since its establishment in 1790. So, long story short, it's a hard bench to knock someone from. The impeachment of justices isn't exclusive to the Supreme Court. As a general charge of misconduct for those in public office, impeachment is also a method for removing federal judges at a lower level. Unlike with Supreme Court justices, there is far more historical precedent in such cases. 1986: Harry Claiborne, impeached and removed after receiving a two-year prison sentence for falsifying his tax returns. 1989: Alcee Hastings, impeached and removed for accepting $150,000 in bribes to reduce prison sentences. 1989: Walter Nixon, impeached and removed after receiving a five-year prison sentence for perjury. 2009: Samuel Kent, impeached and removed for obstruction of justice for lying about the sexual abuse of women he had employed. Seven of the removed judges were district judges, while one sat on the bench at a United States Court of Appeals for the Third Circuit, as well as the United States Commerce Court, which no longer exists. One district court judge resigned before he could be convicted. State courts generally follow similar impeachment processes compared to federal courts, with the exception of a few quirky wrinkles, like how impeachment trials in New York and Nebraska are conducted by a body of state officials and judges rather than by the legislature. 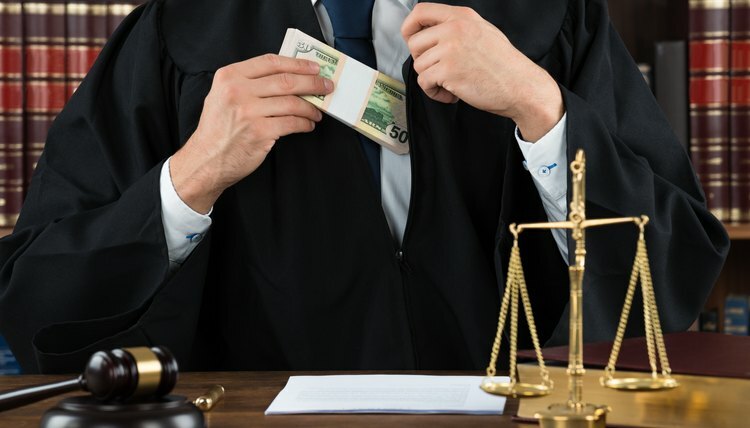 According to the American Judicature Society, the National Center for State Courts and the Brennan Center for Justice, only two state judges were impeached between 1993 and early 2019. WUSA 9: Verify: Can a Supreme Court Justice Be Impeached if the Judge Lied During Confirmation Hearings? Ketchum, Dan. "Rules of Removing a Supreme Court Justice." , https://legalbeagle.com/6596992-rules-removing-supreme-court-justice.html. 29 March 2019.